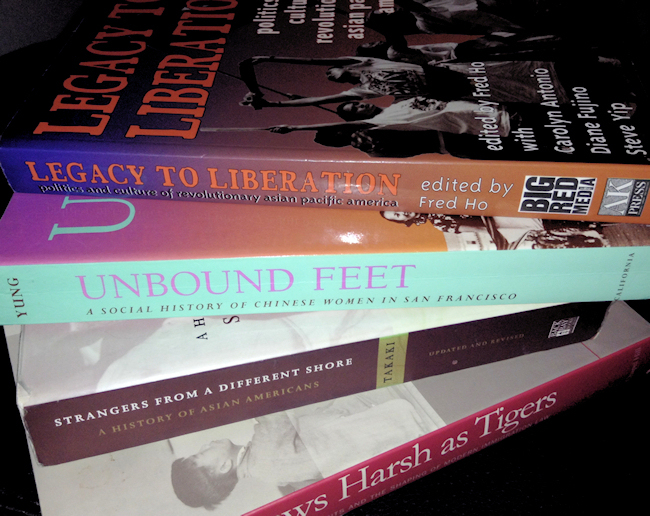 A selection of books from my bookshelf that document a written history of AAPI protest and active resistance. I hate to be that person but I think it’s time we set the record straight, especially since a bunch of journalists are already speculating about the impact(s) of pro-Peter Liang protests on the outcome of today’s hearing: This year’s pro-Liang protests marches are neither the first, nor the largest, nor the most impactful protest movements organized by the Asian American community. Let me be clear: I do not mean to dismiss the achievement of this year’s pro-Liang protests. It is never easy to organize a nationwide demonstration, never mind one that is able to attract 15,000 in a single city and thousands more nationwide. I may not agree (like, at all) with Liang’s supporters, but no one can or should scoff at the community organizing work it took to make these protests materialize. And, quite clearly, these protests, letter writing campaigns, and online petitions had an impact: after DA Ken Thompson said he would not seek prison time for Liang, Judge Danny Chun today reduced Liang’s conviction to a lesser charge before sentencing him to 5 years probation and 800 hours community service for his killing of Akai Gurley. Liang’s supporters will be celebrating today. But, in the interest of an accurate representation of AAPI history, those celebrations must be presented alongside an honest contextualization of AAPI’s long history of vociferous protest movements.